A myriad of problems has led to a “surprising level of foreign dependence on competitor nations,” according to the White House’s long-awaited report on the severe challenges facing our manufacturing and defense industrial base. A look at one field — manufacturing the railroad cars that carry America’s commuters and freight — reveals growing dangers that demand urgent action. Transportation is among the priority sectors under the Made in China 2025 industrial policy, which aims to help Chinese firms in various sectors reach the highest levels of the global manufacturing chain. In the business of railcars, the banner is being carried by China Railway Rolling Stock Corporation, a massive state-owned conglomerate with deep ties to the Communist Party of China. 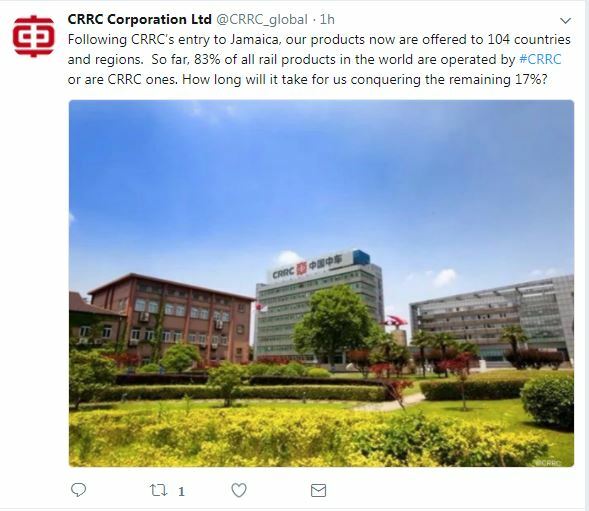 CRRC has set up two U.S. subsidiaries — CRRC MA in Massachusetts and CRRC Sifang Americas in Chicago — and pursues U.S. contracts with predatory zeal. Since 2014, the company has been awarded four contracts totaling $2.5 billion to build metro cars for the cities of Boston, Philadelphia, Chicago, and Los Angeles. In each case, CRRC used massive subsidies and other resources from the Chinese government to dramatically underbid its competitors —regularly by 20 percent or more. In one case, the Chinese bid was half as much as another competitor. To have any company consistently come in so low is unheard of. But the increasing presence of made-in-China rolling stock on North American rails means more than the loss of manufacturing jobs. Modern railcars are not just boxes on wheels, but full-fledged parts of the Internet of Things that soak up and transmit information. The commuter trains manufactured by CRRC will contain Wi-Fi systems, automatic train control, automatic passenger counters, surveillance cameras and internet-of-things technology that will be deeply integrated into the information and communication technology infrastructure of transit authorities, all sole-sourced from a Chinese state-owned enterprise. Chinese surveillance cameras could track the movements and routines of passengers, searching for high-value targets from whose devices intelligence officials can vacuum data from using the train’s Wi-Fi systems. This is not an unrealistic prospect. Already, China is openly developing a system of “algorithmic surveillance” that uses advances in artificial intelligence and facial recognition technology to enable the Chinese Communist Party to monitor the movements and patterns of its own citizens, purportedly to fight crime. The risks are even sharper in freight cars, whose onboard GPS systems and telematics monitor the contents and health of trains carrying sensitive cargo such as toxic chemicals and military equipment. If China is allowed to insert its railcars into U.S. freight networks, it could give Beijing early and reliable warning about U.S. military mobilization and logistical preparations for conflict. It could also give China a destabilizing economic competitive edge, by detecting, say, shortages of critical material such as oil or chlorine gas based on a change in their movements on freight railroads. As well, Chinese internet-connected products on U.S. rails could be designed to be more susceptible to cyber-attack or hacking by third parties, as has been done with numerous other products. While CRRC has yet to produce any freight railcars for the U.S. market, it is clearly on their radar. In 2014, CRRC launched a now-defunct joint venture with an American firm in Wilmington, North Carolina to build freight cars, but shuttered the facility before filling any orders following rounds of layoffs and a federal investigation into Vertex’s ties to the Chinese government. They have also already begun making inroads in Canada with the establishment of a freight railcar assembly facility in Moncton, New Brunswick. Should CRRC shift its focus to freight in the United States, it is likely that CRRC would underbid any American competitors and quickly start to dominate the country’s freight railcar fleet. U.S. lawmakers have recognized and taken steps to address similar threats to products such as computer chips, drones, and cellular technology, and indeed, both chambers of Congress recently passed a ban on federal funding from going to CRRC. Yet policymakers may not fully understand the scope or impact of China’s incursion into an increasingly digitized rail network. CRRC is likely to continue to win contracts without federal funding and the security of the trains already being built will continue to remain in question. There may not be a silver bullet to this problem, but it’s time for our nation’s leaders to put an end to CRRC’s infiltration of the U.S. rail manufacturing industry by developing comprehensive solutions to ensure the integrity of our nation’s transportation systems. Nothing stands in their way. By John Adams // John Adams, U.S. Army brigadier general, is president of Guardian Six Consulting and and a former deputy U.S. military representative to NATO's Military Committee. He is a national security adviser to the Rail Security Alliance, an advocacy organization supported by freight rail manufacturers, suppliers, worker’s unions, and steel interests.